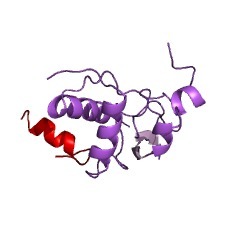 Motif that may be dually phosphorylated on tyrosine that links antigen receptors to downstream signalling machinery. Phosphorylated immunoreceptor signalling motifs (ITAMs) exhibit unique abilities to bind and activate Lyn and Syk tyrosine kinases [(PUBMED:7594458)]. Motif may be dually phosphorylated on tyrosine that links antigen receptors to downstream signalling machinery. There are 2138 ITAM domains in 1409 proteins in SMART's nrdb database. Taxonomic distribution of proteins containing ITAM domain. This tree includes only several representative species. The complete taxonomic breakdown of all proteins with ITAM domain is also avaliable. Click on the protein counts, or double click on taxonomic names to display all proteins containing ITAM domain in the selected taxonomic class. NMR structure of phospho-tyrosine signaling complexes. A structural basis for activation and substrate specificity of src tyrosine kinases, and regulation of protein-protein association by tyrosine phosphorylation is described. Lyn, a src-family tyrosine kinase, recognizes and phosphorylates the immunoreceptor tyrosine-based activation motif, ITAM, a critical component in transmembrane signal transduction in hemopoietic cells. 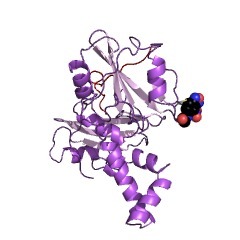 The structure of an ITAM peptide substrate bound to an active form of Lyn tyrosine kinase was determined by high-resolution NMR, and a model of the complex was generated using the crystallographic structure of Lck, a closely related Src-family kinase. The results provide a rationale for the conserved ITAM residues and specificity of Lyn, and suggest that substrate plays a role in stabilizing the kinase conformation optimal for catalysis. It is our hope that the Lck-ITAM peptide model complex will be useful in aiding structure-based drug design efforts that target substrate binding determinants in the design. Concerning the regulation of protein-protein association, we report on a complex between erythrocyte band 3 and two glycolytic enzymes, aldolase and glyceraldehyde-3-phosphate dehydrogenase. 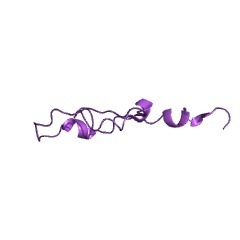 The formation of this complex is negatively regulated by tyrosine phosphorylation of band 3 by p72syk tyrosine kinase. In red blood cells, this association results in a decrease in glycolysis due to competitive inhibition of the glycolytic enzymes. The structure of band 3 recognized by the glycolytic enzymes was determined by solution NMR, and found to be a loop structure with tyrosine centrally positioned and excluded from intermolecular contact. This phosphorylation sensitive interaction, or PSI, loop may be the basis of a general mechanism for negative regulation through tyrosine phosphorylation. Phosphorylated immunoreceptor signaling motifs (ITAMs) exhibit unique abilities to bind and activate Lyn and Syk tyrosine kinases. Signal transduction by T and B cell Ag receptors and certain receptors for Ig Fc regions (Fc gamma RI, hFc gamma RIIA, Fc gamma RIII, Fc alpha R, and Fc epsilon RI) involves a conserved sequence motif, termed an immunoreceptor tyrosine-based activation motif (ITAM) and found in multiple receptor chains. Phosphorylation of the two ITAM tyrosines is a critical event in signal transduction. To address the function of this phosphorylation, we assessed the ability of nonphosphorylated and biphosphorylated ((p)2ITAM) ITAM peptides to bind and modify the activity of src and syk family kinases in vivo and in vitro. All (p)2ITAMs, but not their nonphosphorylated counterparts, induced extensive protein tyrosine phosphorylation in permeabilized cells. However, the patterns of proteins phosphorylated differed among (p)2ITAMs. 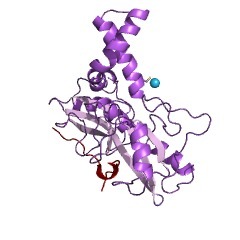 This phosphorylation was found to reflect activation of the src family kinase Lyn, but not Syk. In vitro studies using purified Lyn showed that src family kinase activation resulted from a direct interaction with (p)2ITAM. Binding studies demonstrated clear differences in binding specificity of (p)2ITAMs. Most strikingly, Ig alpha (p)2ITAM and TCR-zeta c and CD3 epsilon (p)2ITAMs exhibit inverse binding preferences for src and syk family kinases. Taken together, these findings demonstrate a novel mechanism by which src family tyrosine kinases are activated, and are consistent with the possibility that different ITAMs may preferentially activate distinct signaling pathways as a consequence of distinct effector Src homology 2 domain (SH2) binding preference. This information is based on mapping of SMART genomic protein database to KEGG orthologous groups. Percentage points are related to the number of proteins with ITAM domain which could be assigned to a KEGG orthologous group, and not all proteins containing ITAM domain. Please note that proteins can be included in multiple pathways, ie. the numbers above will not always add up to 100%.